Former New York City Mayor Michael Bloomberg announced an increased commitment to end America's coal dependency and transition the U.S. economy to a clean energy future. On Wednesday, Bloomberg announced that Bloomberg Philanthropies, an organization that encompasses all of the charitable giving for the former mayor, would be committing $64 million to support the Sierra Club's "Beyond Coal" campaign and other organizations to help move the United States off of coal power altogether. The organization has supported the Sierra Club's campaign since 2011 in its effort to seek alternative clean energy solutions. "The war on coal is saving tens of thousands of lives and we won't stop fighting until we've saved every last one," Bloomberg told reporters at the Sierra Club's Washington office. He added, "Whether you believe what scientists tell us about climate change or not, there's no debating that coal pollution is terrible for our health." The funding includes $30 million to support the "Beyond Coal" campaign through 2020 as well as funding for other groups like the League of Conservation Voters to help speed the transition to clean energy sources on the state and local level. The announcement comes just days after EPA Administrator Scott Pruitt announced the Trump administration's intentions to withdraw from the Obama-era Clean Power Plan at an event in Kentucky on Monday. Former president Barack Obama put the Clean Power Plan into place in 2015 in hopes of reducing carbon dioxide pollution levels by setting individual environmental goals for each state. It also aimed to transition from coal-based energy to wind, solar and natural gas power. "When you think about what that rule meant, that rule really was about picking winners and losers. Regulatory power should not be used by any regulatory body to pick winners and losers," Pruitt said. "The past administration was unapologetic. They were using every bit of power, every bit of authority to use the EPA to pick winners and losers in how we generate electricity in this country. And that's wrong." It was not immediately clear if Pruitt would seek to issue a new rule without congressional approval, an approach criticized by Republicans during the Obama administration. Pruitt's rule wouldn't become final for months and is then highly likely to face a raft of legal challenges. "Not only is the EPA rolling back this plan, but the Energy Department is requesting a massive taxpayer bailout of failing coal plants, one of the worst ideas Washington has ever come up with, which is saying a lot," said Bloomberg. Bloomberg also slammed the Trump administration for providing "false hope" to those looking to maintain a career in the coal industry, as the business continues to shrink, forcing many to lose their jobs. "Coal jobs aren't coming back," Bloomberg stated. "People pretend that they will, but they're only giving false hope to regions where the federal government has failed them for much too long." He said his philanthropic organization has been working to provide grants to individuals working and living in coal country to find new skills to gain new job opportunities outside the industry. In recent months, following President Trump's announcement of the U.S. pullout of the Paris Climate agreement, the former mayor said Bloomberg Philanthropies would commit up to $15 million to help fund global efforts to address climate change that lacked support from the U.S. government. 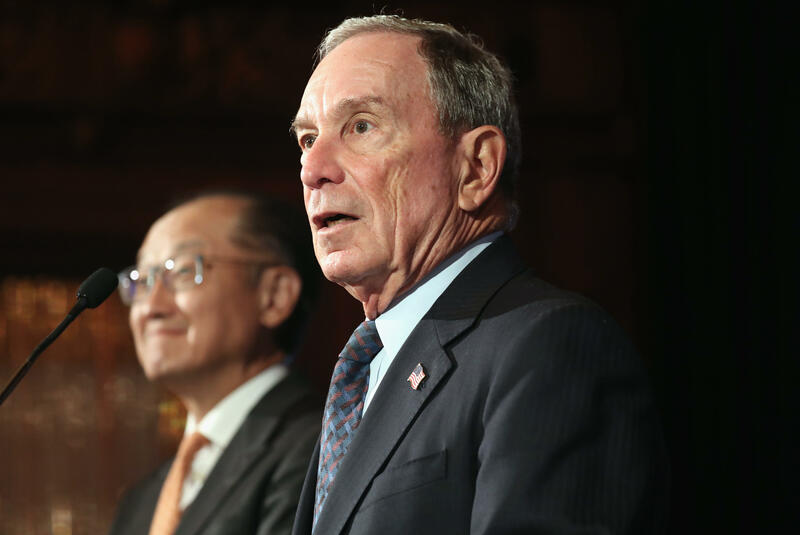 Bloomberg brought together more than a thousand entities -- from cities and states to corporations to universities -- pledging to reduce carbon emissions, independent of federal policy. Bloomberg criticized the Trump administration's lack of pro-environmental policies, suggesting it "sends a message to the rest of the world that it doesn't care about its people." "If you pollute, everyone around the world suffers, the air doesn't stop moving, and we're all in this together, whether we'd like to be or not," he warned. "The best thing that could happen is if the President of the United States, Donald Trump, has an epiphany," Bloomberg added. "It'd be wonderful if he had environmental secretaries and the rest of his administration to work together to try to improve the life and economy of Americans."